Busy week as usual this week. The boy asked me on his way out the door this morning if I would send him our monthly plans for December. With all of the holiday parties and get togethers I guess it is good to have. 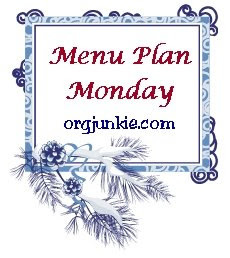 Here is our small meal plan this week, but it is good for me to get back into the habit of this. To find more meal plans, some even with recipes (or more exciting than mine) check here. That is it for the week, I may have to get into planning lunches as well.